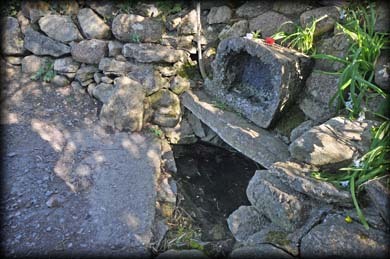 The well with a trough above. I came across the well by accident. I have visited Lady's Island on numerous occasions but had never had the time to walk around the whole island. After taking a few shots of the church and tower house I decided to stroll along the west side of the lake following the pilgrims path to the shrine at the end of the island. The well is located about 100 metres down the grassy track on the left hand side. Apparently the well did not appear on the 1839 ed. of the OS 6in map. So it may be fairly modern. 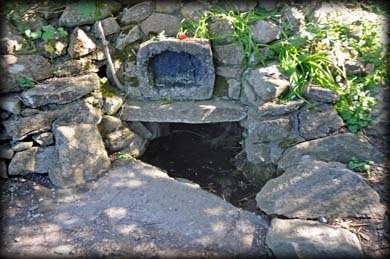 Stopping for prayers at the well has become part of the modern pilgrimage. The water is not safe to drink. Situated: From the tower house take the track to the right along the side of the lake. The well is about 100 metres down here on the left. Discovery Map 77. T 1048 0746. Last visit April 2015.